Well that didn’t take long. 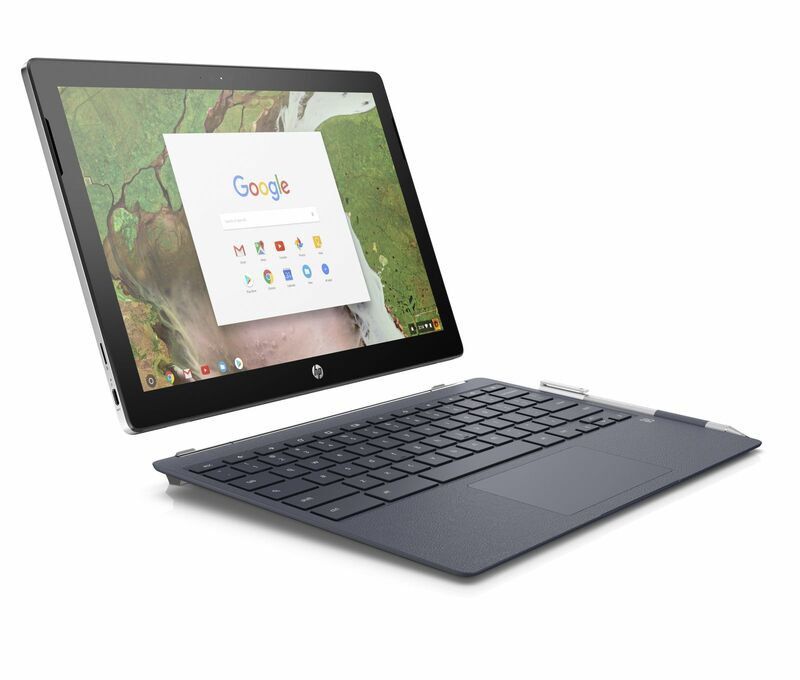 Less than two weeks after the Acer Chromebook Tab 10 was announced, HP launched the Chromebook x2: A Pixelbook-looking Chromebook with a detachable screen. Starting at $599 and expected to be available on June 10, the Chromebook x2 bridges the gap between content consumption and productivity in a single device. I’m not kidding at all when I say the Chromebook x2 has design cues from the Pixelbook. Just like Google’s high-end Chromebook, the HP model also has a 12.3-inch, quad-HD display (which I assume to be the same 2400 x 1600 resolution based on the aspect ratio) and those large-ish bezels around the side. The main difference obviously, is that the display of the Chromebook x2 is removable. All of the hardware — the processor, storage, memory and battery — is inside the display, not the keyboard base. As far as that hardware, you’re looking at a 7th generation Intel Core m3 chip and 32 GB of storage for the base price. There’s also a microSD card slot. HP says memory configurations are available up to 8 GB, but the base model has 4 GB. Battery life is rated at up to 10 hours and there’s no extra juice from the keyboard because there’s no battery inside it. In fact the keyboard is just that: A keyboard with trackpad and magnetic hinges to hold the display as needed. Two USB-C ports a headphone jack and a pair of cameras (5 and 13 megapixels for front and rear, respectively) make up the rest of the tablet package. There’s also a digital pen for inking, drawing and marking up documents. The display on its own is 8.2 millimeters thick and weighs 1.62 pounds. Adding the keyboard base to your backpack and the total package comes in at 3.14 pounds. As a tablet itself, the display is relatively heavy compared to other true tablets but it still seems reasonably portable. Although I haven’t seen the Chromebook x2 yet, the design is exactly what I’ve been hoping for: A versatile Chromebook that can be used for productivity in full desktop browser while allowing for the game changing experience as a tablet running Android apps. I’m looking forward to spending some time with this one! I guess we shouldn’t be surprised that the detachable design adds some weight, compared to the similar-size convertibles (Pixelbook, Samsung Plus and Pro). I wonder why they didn’t use a kickstand design (and lighter keyboard) like the HP Envy or MS Surface. Kickstand might have worked but not sure about a lighter keyboard without it: If the display is heavy, you need a solid base to keep the device from tipping over. I’m sure this won’t be the only detachable we see in the near future; could see a Surface-like design from someone, which would be nice so as to have options. On the HP Envy, the display holds itself up. The keyboard is just a flap. It’s lighter overall, but needs a table to support it. I agree, we’ll probably see a kickstand Chromebook pretty soon. This is more like what I’ve been waiting for. I’m hoping there will be a model with more storage, and that those speakers are nice and loud. I’ve been away from chromebooks for awhile. Ended up getting the 2017 Macbook 12 inch for my international travels. At a mere 2 pounds, it has taken care of my needs while still providing the keyboard.To satisfy the dongle dilemma I purchased a aftermarket multiport adapter which works quite well with Type C power delivery and a number of ports. This device has me thinking though that I could move back but the base storage config of 32gb will always have me remembering some of the feelings after having android phones with that much. Its just not enough I don’t think especially when you combine chrome and android apps. But the big thing to me is being able to detach the keyboard and go from a productivity machine to a consumption device. The macbook 12 inch is great for me in most regards but on crowded buses and smaller flights, it still poses something of a problem. Having something to use in a tablet form factor I think will appeal to those traveling that would like the best of a few worlds. I’ll be watching reviews and use of this device. I’d like to have one with 4gb of memory but 64 or 128gb of storage instead. Recently picked up the Flip C101PA and love it, but the only thing that could improve it would be making it detachable. This is definitely the next step. Regarding the HP solution I don’t think this is the best option. The keyboard hinge looks really bulky compared to the slim tablet and keyboard. I agree with some of the other comments regarding the Surface design being a better choice. 1.4# is a lot of weight for a keyboard that contains nothing else. I get why it needs to have enough mass to support a 1.6# display, but the passive ballast could have been patrially composed of more battery capacity.